Another busy month has wrapped up with the Qld Rock Breaker service team. Remember we carry out servicing and repairs to all brands of rock breakers. With the recent wet weather both in Nth QLD and in SEQ, we have seen a rise in hammer service work due to water damage. Some of this may be attributed to incorrect storage principles, leading to contamination of the internal piston. When rock breakers are stored laying exposed to the weather, water/ moisture damage can occur on the piston surface, causing the piston surface to start to rust. Water can run down the working tool or down past the tool retaining pins, causing water/ moisture to sit in the tool retaining pin area of the breaker the piston. The piston will start to rust in a short period of time. In most cases the piston damage is identified the next time you go to use your breaker, usually when you are about to start your next job! For extended periods, store your hammer in an upright position. Where possible always store your breaker inside or under cover when not in use. If it is not possible to store the breaker undercover, cover the breaker with a tarpaulin or similar. 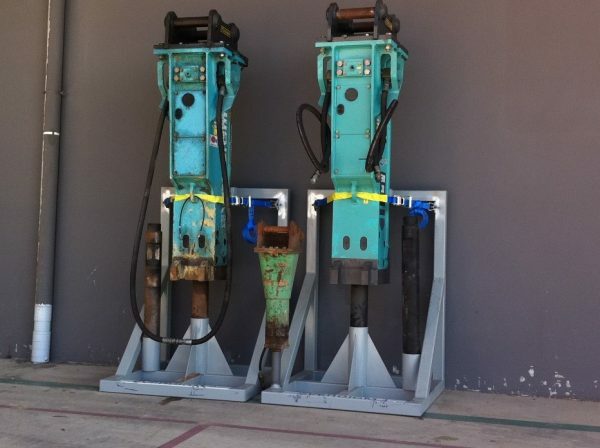 Contact our service team today (07 3715 0800) and discuss your rock breaker requirement’s. Mention a gas check and they will carry this out at our service premises, free of charge for the months of April and May 2019.